Baklava is one of my all time favorite desserts. I have made it a few times over the years so I know the amount of work that goes into it! I found this recipe here. This is a decent recipe but found it had more of a honey taste. As much as I love honey, it was just not the kind of baklava that I enjoy. Remove the phyllo dough from the fridge 1 hour before using. Keep the phyllo dough covered with plastic wrap and a damp cloth when you are not using it. Toss the chopped nuts with the cinnamon and set aside. Thoroughly butter a rectangular baking pan. Make sure the sheets of phyllo will fit the pan. Butter the top sheet of phyllo with melted butter. Then grab it and the unbuttered sheet below it. Set the two sheets in the pan, buttered sheet face down. Press lightly into the pan. Repeat this twice more, so that you have 6 sheets of phyllo in the pan, three of the sheets buttered. Sprinkle on enough nuts to make a single layer. Butter two sheets of phyllo and place them on top of the walnuts. Add more walnuts, then two more buttered phyllo sheets. Repeat this a few more times, or until you are out of nuts. Top with 4 more buttered phyllo sheets, ending with a buttered top. Cut a diagonal diamond pattern in the baklava using a very sharp knife. While the baklava is baking, combine one stick of the butter, honey, water, sugar, and vanilla in a saucepan. Bring to a boil and then reduce the heat to low. 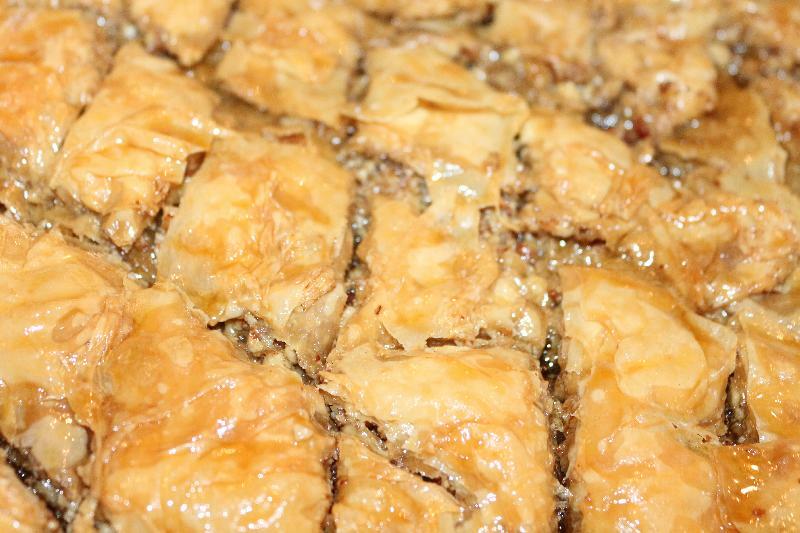 When the baklava finishes cooking, drizzle half of the honey mixture evenly all over the top. Allow it to sit and absorb for a minute. Then drizzle on a little more until you think it's thoroughly moistened. Finally let the baklava cool, uncovered, for several hours. Then enjoy!